Circus World (1964), released in the UK as The Magnificent Showman, reunited Tiomkin with producer and fellow Russian immigrant Samuel Bronston, for whom he also scored The Fall of the Roman Empire (1964) and 55 Days at Peking (1963). Circus World, directed by Henry Hathaway, stars John Wayne, Rita Hayworth and Claudia Cardinale, with Wayne as an American circus impresario who takes his ‘big tent’ on a disastrous European tour. 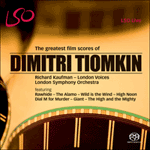 The early 1900s setting allowed Tiomkin to write an original score which tapped into the American folk-song idiom, incorporating such tunes as ‘Oh! Susanna’, ‘Turkey in the Straw’, and ‘Sweet Betsy from Pike’, as well as music by John Philip Sousa and Stephen Foster. Tiomkin dedicated the toe-tapping, circus-flavoured march in the score to his friend Wayne and fittingly titled it ‘The John ‘Duke’ Wayne march’.